Ollie came into our lives on a warm and sunny Easter Sunday in 2008, my baby brother and sister were a bit sad because I was moving out of my parent’s house into my own apartment about 25 minutes away. My boyfriend at the time had been telling me that he wanted to give my two little ones a surprise so they wouldn’t be as sad that I was leaving. He told me that he wanted to give them a bunny, but wanted to make sure that my parents would be okay with that. My parents love animals and the house already had a playful Labrador named Oreo, a shy but loving Border collie named Poppy, two chirpy parakeets and two feisty cockatiels. I told him that my parents would be more than happy to add another member to our family and that everybody would love the bunny. He asked me to keep it a secret because he wanted to surprise the kids when he came over. And that’s when on that sunny Easter Sunday he showed up with little Ollie Wollie. Ollie grew to be a healthy, playful and loving bunny, she loved to run around when she was out of her cage. She would chase you and run in circles to show you how much she loved you. A time came when I brought Ollie to my apartment, much had to do with me being sad and feeling lonely living by myself and I knew that Ollie would be the perfect companion. She loved my apartment, she liked to explore every corner of my tiny one bedroom apartment. At first, she would chew on cables, couches and nibble on the carpet. Every time I was in the kitchen, she’ll hop around and during the summer she would keep me company in the kitchen by laying on the linoleum floor. At night when I would watch TV sitting on the floor she would lay behind me while eating carrots. She was the most lovable bunny ever. I must say that during my saddest times, playing with her cheered me up like no one else could. Last summer she started getting sick – We were all puzzled because she was dropping weight fast. She used to be a chubby and playful bunny. My friends would make fun of her and call her “Olliezilla” because she was huge! The weight started dropping and she wasn't her playful self, so I asked my friend Alex (who is the greatest animal lover there is) as to who would be the best vet where I should take Ollie. She recommended Dr. Harvey and I immediately placed the phone call to set up and appointment and bring her in. Ollie was slowly drifting away, besides losing weight she started losing control of her front limbs. She stopped using her litter box and she would just lay there looking as though she was in terrible pain. I brought her in to see Dr. Harvey and she ran some tests to check for common diseases in rabbits and they all came back negative. She was as puzzled as the rest of us, she ended up prescribing antibiotics, anti-inflammatory and some other medications. The medication worked for a while but I had to bring Ollie in three more times. She was a fighter; all throughout her sickness she kept hope alive. Unfortunately her unknown sickness took the best of her, despite how hard she fought for her life she didn’t win the battle. She went from being a fatty Olliezilla weighing in at 15lbs to a tiny and fragile 4lbs little itty bitty thing. Ultimately, my family and I made the decision to put her to sleep. We all knew that it was selfish to keep her around knowing that she was suffering. It was time for her to leave her sickness behind and go to heaven. Putting her to sleep was one of the hardest decisions of my life, seeing her life slowly leave her body was devastating and painful but I knew that she was off to experience new adventures. Off to nibble couches in heaven, to chew cables and most of all to share her love with those up in heaven. In the end, she knew how much we all loved her; how I did my best to make her feel better and I thank her for sticking through to give me another year and half of happiness. Perhaps some people might not understand what a pet can mean to you. The joy and love that they bring to your life and that in your darkest and saddest times their love and devotion can light up your life. 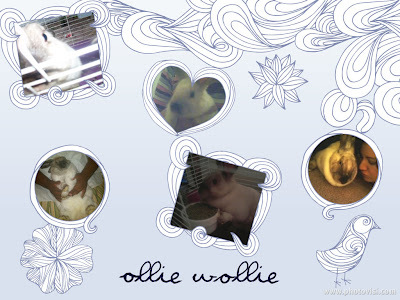 Ollie will live in my heart forever and I will treasure the memories that I have of her for life. To Ollie: Thank you for the happiness that you brought to my life, your unconditional love was like no other, RIP my little Ollie Wollie.